To walk the hills and valleys of a bipolar mind. 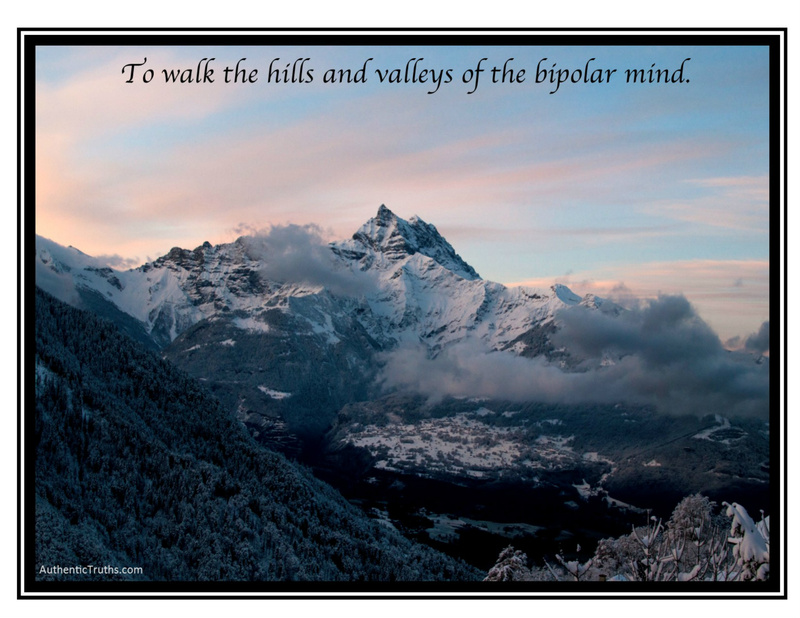 When I set out on this journey of writing a blog in attempts to share my experience of being a Christian living with bipolar disorder, I thought it would be easy to jot down my experiences, I thought that I had been fairly transparent in my life with many, so therefore, this project would come easy. I was very wrong. While I’ve always been open and forthcoming with my immediate family, and a few select friends, I’ve come to realize, I kept most of journey tightly sealed in the deep caverns of my mind- some not even shared with those closest to my heart. I guess there are many reasons why I would hold tightly to some parts of my story than I do others, but for the most part, I’d say so much of what I’ve conquered I didn’t think others would understand. Bipolar disorder is complex, many people think I’ve made it look easy, and though I’ve always tried to appear like a strong enough woman, there are times what was seen, wasn’t truly the story. So there we begin…. What is the story? And since I’ve come this far in exposing my secrets, can I sum up the courage to keep going? You see, mental illness comes with such a stigma and often discrimination, that those of us living with it, hold back. There aren’t always words to share what we are going through, not always words to describe the hills and valleys of rugged terrain we must maneuver just to function on some days. I know efforts are being made to educate others, to remove those stigmas and fears, to find a road to recovery that includes proper medical care, support and understanding, but still, we’ve got a long way to go. I’ve come out of my shell in the last couple weeks, and shared with a couple people the struggles I’ve had over the last six months, and people are shocked to hear it. One person commented, “You would never know that by watching you.” I pray, one day, that people will truly comprehend that I can live with bipolar and still believe! I can suffer with depression and still praise the Lord! I can be down but my faith will rise, my prayers will still be lifted and my hope will carry me. I have Jesus Christ in my heart. I have surrendered my entire being to following my Savior! He inspires me on a daily basis through his word. He reminds me that in my brokenness, I am still a beloved daughter of the King-forgiven, free and set apart. When we stumble, He picks us up. When we cry, he holds us tenderly. We never have to be alone, no matter how alone we feel on the outside. When I can’t find strength to face tomorrow, He provides. The Holy Spirit knows my heart and my mind, knows full well when I’m not sure about this life, and knows how to comfort me in my most trying times. Where does this come from? It starts with believing and accepting Jesus into your heart. Without that first step, we can’t get to the next…. If you need prayer, please go to our contact page and submit your prayer requests. I am happy to pray for you! **This blog discussion in no way is meant to replace a diagnosis, treatment plan or help of a professional doctor or counselor. If you are in need of medical help, I advise you to seek the assistance of your medical team immediately.